CARiD.com is here with some great news on CURT products. 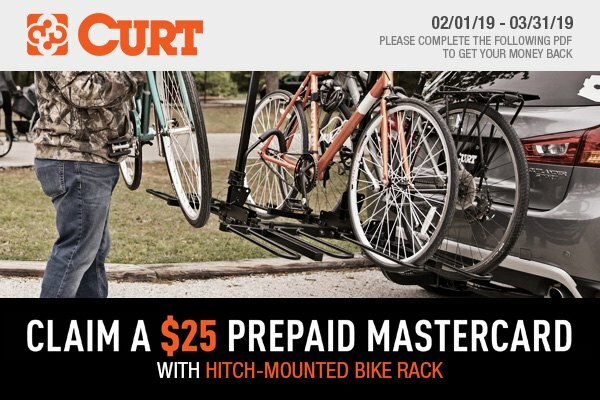 For a limited time, we welcome you to take advantage of our freshest promotional offer on CURT and get a new Hitch-Mounted Bike Rack for your Tahoe at a heavily reduced price. Make your purchase till the end of March 2019 and claim a $25 PREPAID MASTERCARD. CURT bike racks are built tough, made to fit 1 1/4" or 2" receivers and allow you to carry from two up to five bikes, depending on the model. Stop worrying about wasting your interior space, Curt products will let you grab all your family’s bikes on a weekend getaway with you.